Oldsquaw hen by Joe Lincoln of Hingham, Massachusetts (est. $74,750/86,250) brought $74,750, the top lot in the auction. An oldsquaw hen by Joe Lincoln of Accord Village, Massachusetts sold at its low estimate $74,750 at Decoys Unlimited’s annual Cape Cod auction on July 26-27, 2015 at the Cape Codder Resort in Hyannis, Massachusetts. It was the top lot in a sale that was dominated by New England decoys and decoratives, which accounted for the 13 highest-priced lots in the auction, as well as 20 of the top 27. A Lincoln miniature hissing Canada goose at $5175 tied for last place on that list. A dozen lots by A.E. Crowell of East Harwich, Massachusetts made the list, topped by an early pre-stamp redhead with carved and crossed wingtips at its low estimate $46,000. There were three ducks with oval stamps: red-breasted merganser at $20,700, pintail at $13,800 and mallard at $11,500, all selling at their low estimates. A high-head bluebill topped estimate at $6325 and a canvasback made its high estimate $5750. A running yellowlegs, the only shorebird on the list, sold for its low estimate $16,100. The only Crowell life-sized screech owl we’ve ever seen topped estimate at $14,950. Two additional life-sized decoratives, a least sandpiper and a tern, brought $11,500 and $7475. A set of 25 waterfowl miniatures made estimate at $28,750 and a pair of miniature Canada geese mounted on a single base topped estimate at $8913. A standing decorative wood duck by Charles “Shang” Wheeler of Stratford, Connecticut sold just short of estimate at $34,500. An oldsquaw in winter plumage by Orlando “Os” Bibber of South Harpswell, Maine just missed estimate at $23,000. 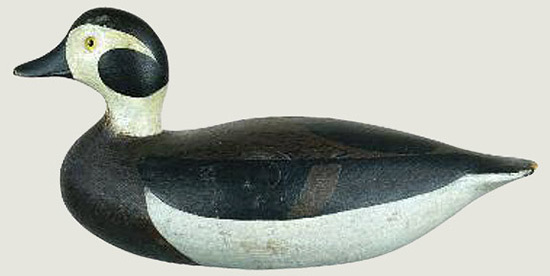 A hollow-carved black duck by a member of the Pease family of Martha’s Vineyard made estimate at $20,700.